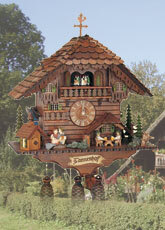 The Cuckoo Palace is a partner of some of the most renowned cuckoo clock makers in the German Black Forest. 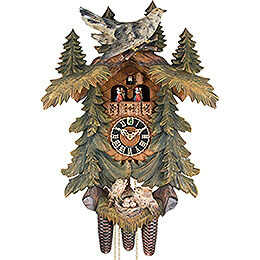 All of our clocks are 100% Original Black Forest Clocks and all our mechanical clockwork cuckoo clocks have the VDS Certificate of Originality. 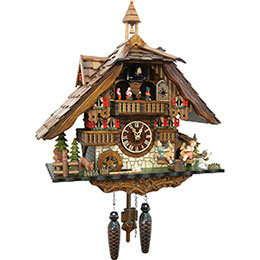 Please step inside the Cuckoo-Palace and enjoy our large variety of authentic cuckoo clocks and shield clocks with many highly detailed pictures of each clock, comprehensive product descriptions and a growing archive of videos and sounds of our cuckoo clocks. 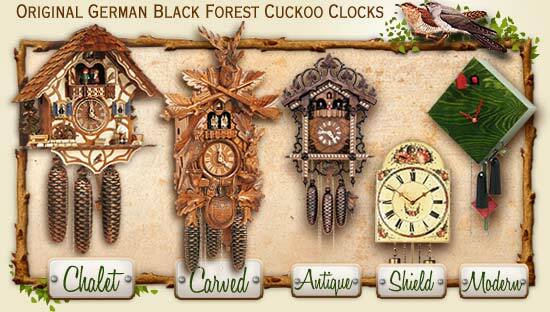 Here at the Cuckoo Palace you find nothing but 100% original Black Forest clocks from the most renowned producers in the region. 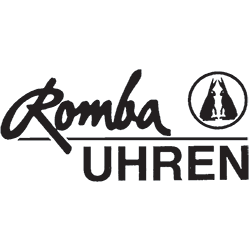 Our shop makes it possible for you to buy these German artisanal products conveniently and securely online. 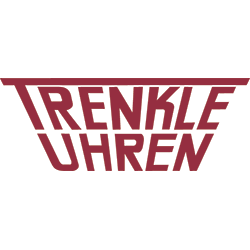 The process includes quality controls and secure packaging of all products, as well as qualified answers to any questions you may have, prompt and courteous customer service and a selection of several different convenient payment methods. 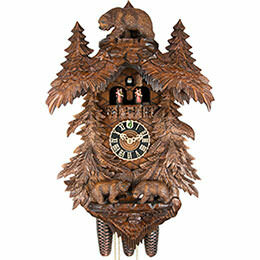 We offer a rich selection of the most different Black Forest clocks. 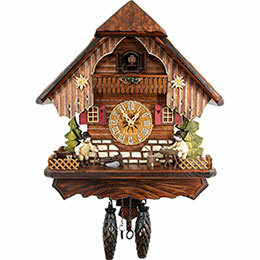 You can find the world-famous cuckoo clocks on our website in all of their diverse forms. 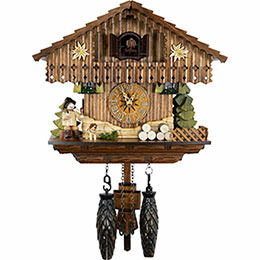 The large assortment of chalet-style clocks and cuckoo clocks with wooden carvings is completed with reconstructions of antique models and a collection of cuckoo clocks with modern designs. Traditional mechanical clocks where the weights operate a gear train in the clock’s interior are available with 1-day movements or 8-day movements, which only requires winding once a week. 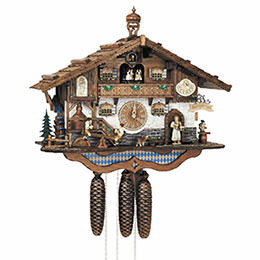 Many of our cuckoo clocks are additionally furnished with a high-quality musical mechanism from the company Reuge. 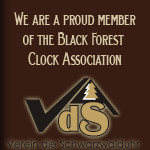 All Black Forest cuckoo clocks with a mechanical movement include a certificate of authenticity from the VDS (Black Forest Clock Association). Alternatively, you can also choose a clock with a quartz movement. They have the same high-quality, hand-made wooden cases, but are very simply operated with standard batteries. 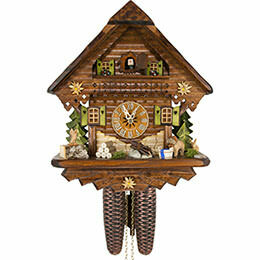 We hope you enjoy browsing in our shop while searching for your very own Black Forest clock. 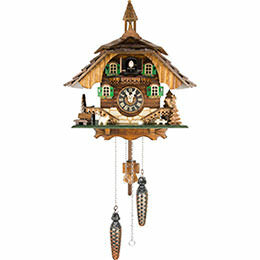 Alongside other decorative carved products such as nutcrackers, candle arches or Christmas pyramids coming from the German “Ore mountains” in the eastern part of Germany, German Cuckoo Clocks are likely the most popular representative of Germany's rich tradition of craftsmanship and have to some extend become “the” symbol people all over the world think about when it comes to Germany. 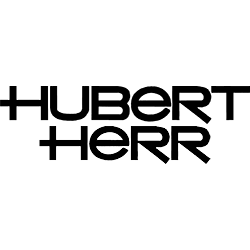 A traditional industry dating back several centuries, the manufacture of these vintage timepieces is closely associated with the “Schwarzwald” – the Black Forest region in south-west Germany. Here, severe winter snows in a harsh climate prevented most agricultural work. 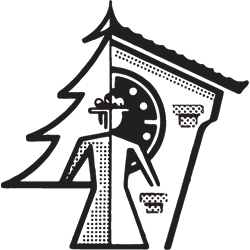 The farmers traditionally spent the wintertime with carving and creating household things or toys and other wooden objects. 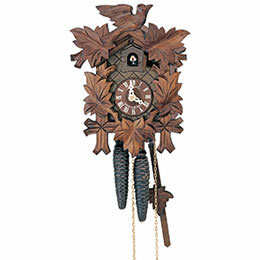 It is hard to say who made the first blackforest clock, but the origins surely date back to the 17th century. 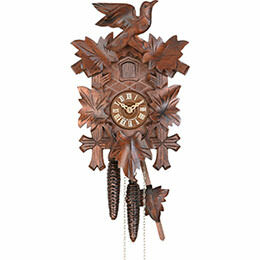 The first clocks were rather rustic objects, entirely made of wood, and thus available for most people. During the 18th century every family wanted to have their own clock, or even more than one, and the boom of the clock industry began. The blackforest woodworkers were very skillful and creative and always looking for new ways to improve their meagre incomes. 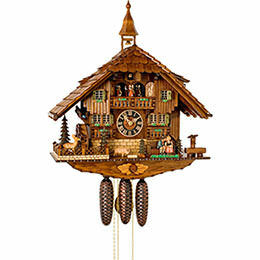 So, when the feature of a cuckoo, announcing the time when the hands pass the full hour appeared in the first clocks, this nice little detail was soon used by the blackforest clockmakers and the “blackforest cuckoo clock” advanced with overwhelming success throughout the following centuries. 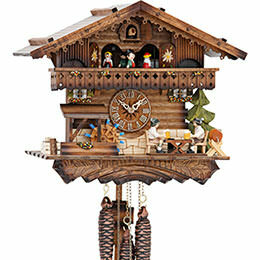 Very soon the black forest clocks were known for their stability and accuracy. Furthermore, blackforest clockmakers could use large trade routes already used by the local glass industry, to spread their clocks not only in Germany. With the return of spring, these rural clockmakers would load a cart with their accumulated winter stock of clocks, and “clock carriers” took them to local German markets, but also to France, Italy and other countries. 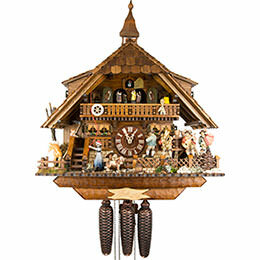 The clockwork movement, known in German as “Uhrwerk”, originally used to power the handsomely carved Schwarzwald cuckoo clock was devised with characteristic ingenuity. 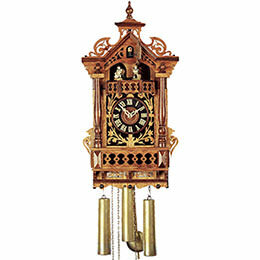 At first each movement was fashioned entirely from wood – but clocks with more endurable and accurate metal movements soon appeared, and remain part of the standard specification down to the present day. A typical mechanical clock movement is driven by power derived from a heavy weight traditionally shaped like a fir cone. The weight attaches to a chain, which is itself connected to the internal clock mechanism, and transmits movement to the machinery of gears and levers inside. The clock's pendulum ensures constant intervals. 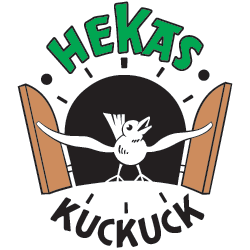 Most movements require not one fir-cone weight, but two – one to power the clock, and the other to animate the cuckoo, or even three, if they have an additional musical movement playing a tune after the cuckoo call. 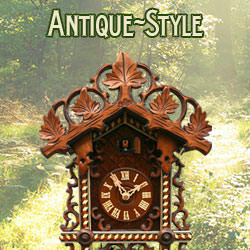 Two types of mechanical movement are fitted to an authentic clock made in true vintage style. The first is a “one day” movement, which requires rewinding each day, whilst an “eight day” clock-movement will run for a week before rewinding becomes necessary. 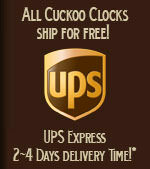 Cuckoo-Palace are happy to arrange the purchase, shipping and delivery of both “one day” and “eight day” timepieces. 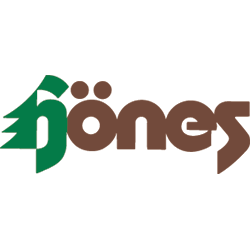 Their online shop has convenient payment facilities for customers worldwide, whether based in Euro-, GBP-, USD zones, or elsewhere. 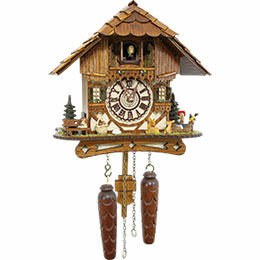 In addition, many cuckoo-clocks also incorporates a musical movement playing a repertoire of traditional German or Tyrolean songs familiar to a worldwide audience, adding to the vintage atmosphere these timepieces seek to recreate. 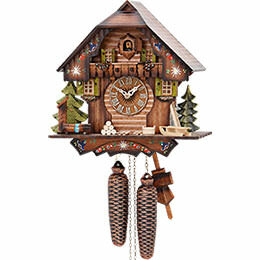 “Musical” cuckoo clocks have an extra fir-cone weight fitted to drive the musical mechanism, and purchasers searching online for a musical clock to buy will find the Cuckoo-Palace stock a fine selection of authentic models ready for instant shipping and delivery. 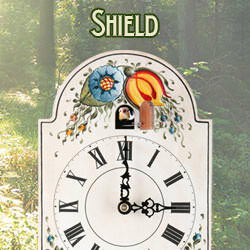 The Shield clock, known in Germany as “Schilderuhr”, is generally regarded as the historic precursor of the vintage cuckoo-clock timepiece. Whether voiced with a quail- or cuckoo-call, this simple model has a square frontal shield which is attractively decorated and handpainted. Above this is a highly decorative wooden semicircle which carries a separate scene, perhaps with moving figures. A more nuanced choice lacking the worldwide reputation of other Schwarzwald timepieces, the Schilderuhr clock may perhaps appear in the cart of those who admire its restrained appeal. 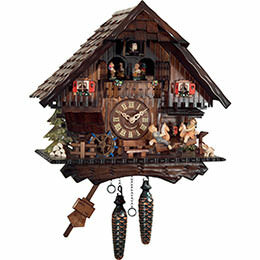 The Chalet-style clock with its trademark Black Forest- or Alpine house is a popular buy regularly selected for the customer cart, and undoubtedly the most recognisable item of the cuckoo-clock genre. 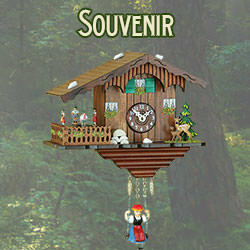 Invariably presenting a cameo image of Schwarzwald pastoral life, such charming “toytown” scenes are guaranteed to capture any child's attention, and the hearts of everyone else. 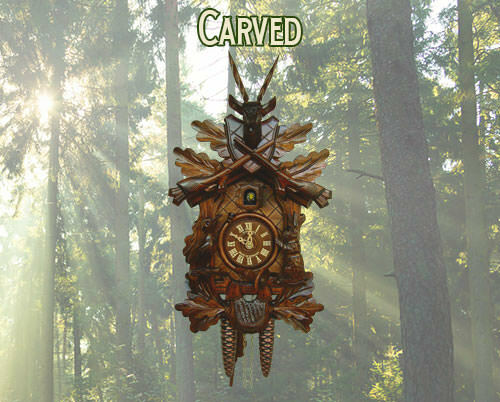 The so-called “Carved clock” is the most intricately carved of all Black Forest timepieces, and is commonly decorated by the leaves of a vine tendril and either bird or hunting symbols. Master craftsmen fashion elements such as the antlers of mature stags, and woodland leaves and vines, in exquisite detail, using wood from the Linden tree which grows in the Schwarzwald. Undoubtedly a premium option, a beautiful carved clock secures a high price, for which one gains a treasured heirloom in return. 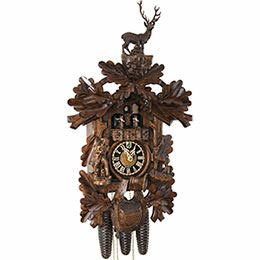 It has been said the Black Forest clock belongs to “the past, the present and the future”. And if that is so, then – no matter which item you load in your cart – the Modern cuckoo-clocks available to buy in the Cuckoo-Palace online shop demonstrate that the future is in remarkably good hands. 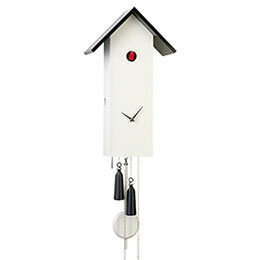 Though these models preserve the cuckoo-call as the link with their heritage, in every other respect, creative artists, designers and clockmakers have reinvented the genre for our modern age. New models explore exciting colours, unusual shapes, and fresh materials – often with entertaining or thought-provoking results – in a kaleidoscope of contemporary innovation which neatly counterbalances the mature designs of the stock built by vintage clockmakers. 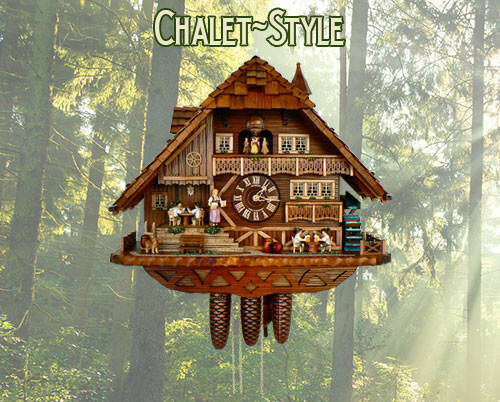 Carved, Chalet and Modern clocks are both available with the traditional mechanic movement (one or eight day movement) or in quartz versions, powered by batteries, which have a digital cuckoo call. 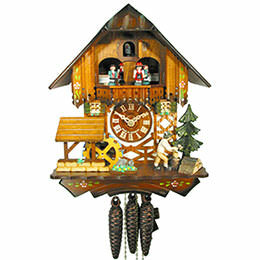 Though the day of the lone craftsman has now gone, genuine cuckoo clocks are still handmade using techniques handed-down by the Schwarzwald “Uhrmachers” (Clockmakers) of old. The vintage timepieces Cuckoo-Palace has in stock originate from one of eight long-established German manufacturers, all accredited members of the Black Forest Clock Association, whose production uses traditional materials and methods. 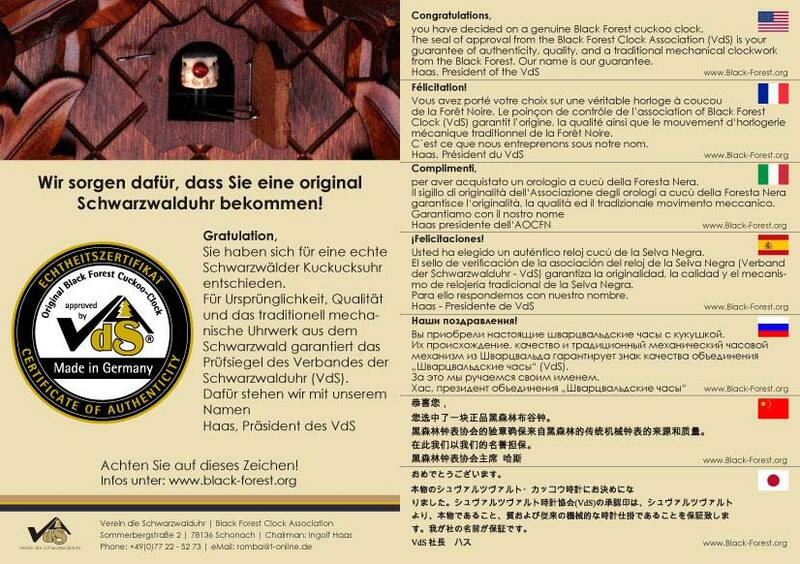 In addition, any authentic cuckoo-clock timepiece which a customer chooses to buy from the Cuckoo-Palace online shop, will carry a VDS (Verein die Schwarzwalduhr) certificate confirming the item is an original from the German Schwarzwald. 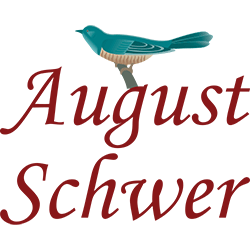 To gain such accreditation, an item must have a genuine mechanical movement, meet exacting quality standards, and must have been crafted by a clockmaker within the Schwarzwald. Thus purchasers worldwide can shop safe in the knowledge that any VDS-labeled item in their cart is trademarked and guaranteed to be authentic. 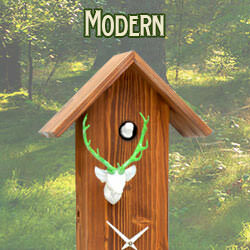 Cuckoo-Palace always takes the utmost care when shipping high-quality German cuckoo clocks for delivery worldwide. For customers who would like to make their own shipping arrangements, the Cuckoo-Palace website has some useful packing guidelines to avoid damage and ensure safe delivery. When you receive your new acquisition, similar care should be taken to observe the following general information. mount your clock at the height specified by the manufacturer – at least five feet above ground level. send back fir-cone weights if your clock is returned for attention. Instead, enclose any part numbers or other information marked on each weight. clock-size is certain to determine price – a smaller clock (around 7 inches) is more affordable than an award-winning masterpiece 28-inches tall, so where quality is concerned, every inch counts! 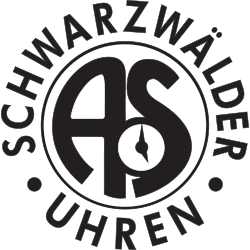 Taking delivery of your first VDS-accredited Schwarzwald timepiece is an unforgettable moment. You will be joining a worldwide community of discerning connoisseurs, significantly enhancing the appeal and ambiance of your home, signaling your intention to live your life at a different pace, and taking ownership of a superb example of timeless beauty and craftsmanship. There will indeed be much to celebrate!